Fröccs: Hungary’s Favorite Summertime Drink – if you can pronounce it! Home Expats in Hungary Fröccs: Hungary’s Favorite Summertime Drink – if you can pronounce it! Spring has sprung and it’s time to start ordering Budapest’s most popular hot-weather drink: the fröccs. But you’d best practice with a Hungarian friend before trying to order one. This may be the favorite time of year for Budapest residents: a warm spring. Time to watch the Danube boats glide by as you sip Hungary’s wonderful contribution to the summer-drink list: the ubiquitous fröccs. Too bad it’s so difficult for expats and tourists to order because it’s so darn hard to pronounce! But let’s start at the beginning. The fröccs (in reality, just a wine-with-soda spritzer) is a truly versatile beverage, appropriate for every season. But when the weather gets hot in Hungary—and stays hot for months—it’s hard to beat a cool, fizzy fröccs. It’s a refreshing drink, accompanied by a mild, long-lasting buzz. It’s the ultimate summer go-to drink in Hungary, and pretty much every bar, terrace, café and bisztró in Budapest offers its own special variation on this soothing concoction. 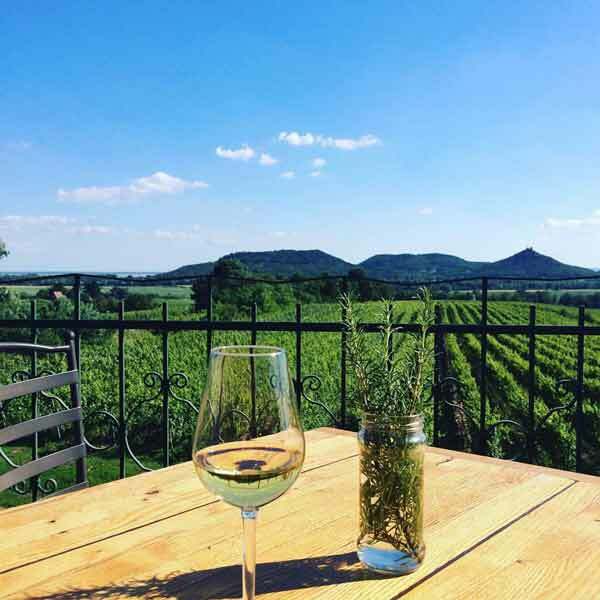 Wine puritans may turn up their nose at the idea of diluting wine, but in Central and Eastern Europe fröccs is the de rigeur drink of the day once winter greyness gives way to summer sun. For all its variations and new-wave popularity, this fizzy refreshment is the drink imbibed by men and women of all ages and social classes. Basically, fröccs is Hungary’s best prescription to beat the heat. Surprisingly enough, to most people, the humble wine spritzer was actually invented in Hungary. After soda water was created on an industrial scale way back in 1826, the obvious (to Hungarians, anyway) next step was combining this unique fizzy water with wine. Supposedly, the term fröccs was later coined by poet Mihály Vörösmarty, who drank astonishing amounts of this refreshing drink and even wrote a poem about it. By the late 19th and early 20th century, fröccs became a staple sold throughout the country, from Budapest’s trendy coffeehouses to the countryside’s busy railroad stations, and was popular with swells and workingmen alike. The term “fröccsözni” (to drink one or many wine spritzers) became as popular as the drink itself. One doesn’t just plop down in their chair at a favorite summer terrace and order a fröccs – even if you can pronounce it correctly. The true fröccs connoisseur, like the true ‘wine snob,’ enjoys the process as much as the results. First – the wine. Never go for the cheapest wines on the menu. Soda won’t make cheap wines taste any better and may even result in terrible next-day hangovers (to which your author can attest). 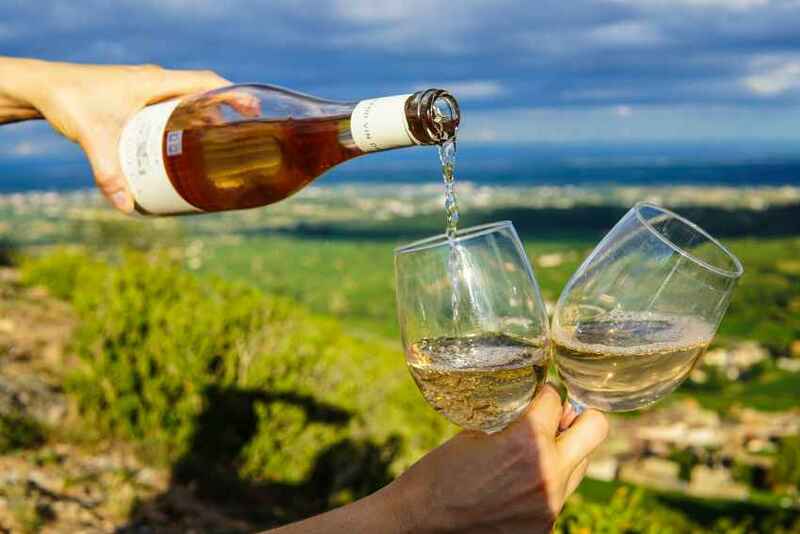 White or rosé wines make the best fröccs, but stay away from the sparkling or long-mellowed wines. Also, the wine should be cold when the soda is added, because, despite gasps or horror from our American friends, ice-cubes just don’t go well with any wine creations. A determined search of Budapest’s best fröccs bistros should result in finding one that appreciates the ‘perfect combination’ and will afford you many happy hours of fröccs-sipping. Next, the soda – NOT sparkling water, if at all possible. Stay away from flavored water or, even worse, water enriched with minerals. Want to read more about iconic Hungarian food and drinks? Check out our article on edible and drinkable Hungaricums! Serving a great fröccs doesn’t require a crystal glass or a tiny drink umbrella, strange coloring or even a straw. It tastes good when served in any type of glass, although for special occasions, fruits and flowers can serve as decorations. And, when the summer sun is at its hottest, well, OK, you can even order your fröccs with ice cubes – but be prepared for stares and giggles from your waitress. What is the best time to drink a fröccs? Connoisseurs prefer their drink either at night or during the day in any of the year’s four seasons. It does, however, seem to go best in warm weather because of its cold and light flavors. One thing to keep in mind: a fröccs is a tricky drink – even though its alcohol content is low, it goes to your head easily due to the soda. Cheers!